What a beautiful lace outfit? Very elegant and feminine. My inspiration for this challenge comes from the lace dress, the green indoor plant and black accents from the pot and chair. Here is my take on the challenge. 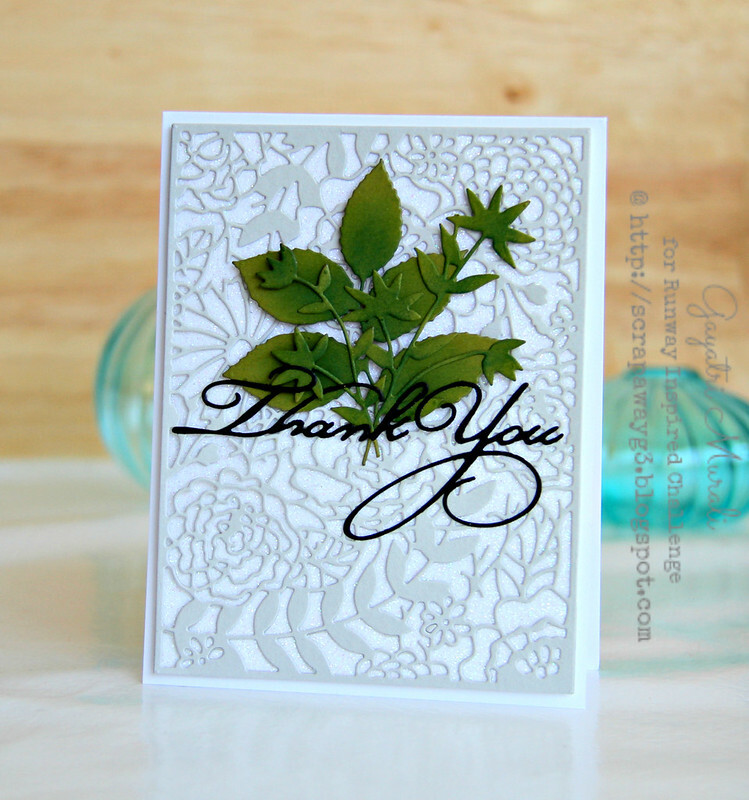 To get the lace effect, I die cut The Garden die from Penny Black using Simon Says Stamp Fog cardstock. I layered and glued this die cut on white glitter paper. This I adhered to a white card base. For the focal point, I die cut Lively and Flower Frolic die also from Penny Black using green cardstock and sponged some Pine Needles distress ink to add shading to the die cuts. I layered the die cut on the card front and flush glued them. 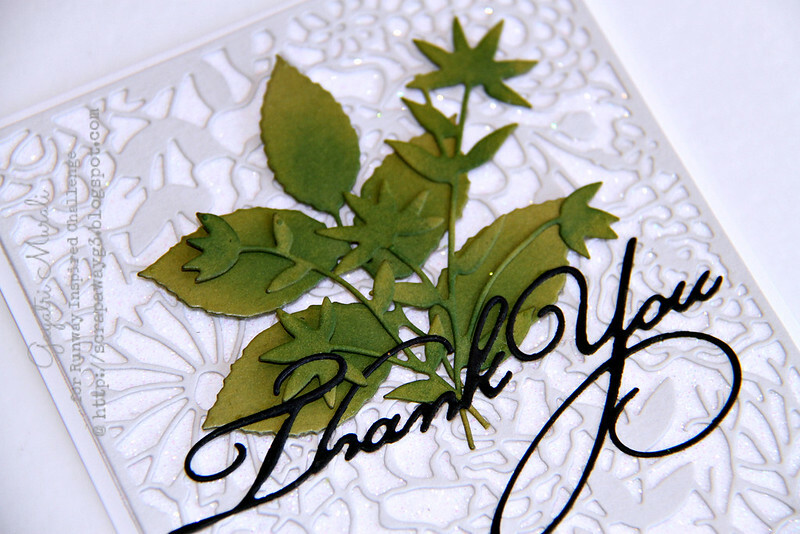 The sentiment is also from Penny Black called Stylish Gratitude. I did not add any embellishments because the glitter on the background is enough to add interest to the card. Here is a closeup of the card. This is a no stamping card. Just using die cuts and cardstocks. Hope you like it. Check out Runway Inspired Challenge Blog for more design team inspiration on the challenge. Come and play with me to enter a chance to win gift certificate. WOW – this is exactly why I follow you – gorgeous card. The green leaves are perfect and love how the glitter paper underneath really shows off the beautiful lace affect. Very beautiful and elegant take on the inspiration pic, Gayatri! WOW!! what a lovely card, the glimmer paper behind that gorgeous die cut really makes the whole design pop. Love the beautiful green accents, this is a very elegant take on the Runway Inspired inspiration photo.